Hey wow, are there any more pics? great post, are there any intaglios in america besides the snake mound in ohio? Google Earth is super cool found a free download for it at getearthfree dot com. I'm sorry to see popular science doesn't filter out profane comments like the one above. I guess this isn't a site for kids! Wow, that picture is weird. I have to say that if this image hasn't been enhanced then it is pretty amazing. I'm not sure about "Sigmund Freud sitting atop the Guardian’s head? ", but on closer imspection I see what looks like Van Gogh to the middle right edge of the frame looking up at an angle. Also, could this explain the face on Mars as a natural phenomenon? Is the indian using a IPOD ? This is a nice finding. You can view more amazing pictures captured by Google Earth by clicking on Posted By link below. It looks like a native american listening to an iPod. OK, not to be a nay-sayer-- the image is cool-- but it's not really that unbelieveable for a couple reasons. 1. The surface of the earth is vast and there are plenty of chances for a natural, 'random' formation to develop in a way that resembles something familiar to the human mind/eye. 2. The human mind is conditioned to recognize shapes and forms that are familiar. Think of a cartoon character's face. It doesn't REALLY look like a face-- there is much information missing-- but the mind fills in the gaps and sees something familiar. Old. Old. Old. News. Yawn. Furthermore, "BillGay8s", obviously my previous comment certainly appliesto you as well, as your desire to use profane language simply puts your own lack of intelligent vocabulary on display for the entire world to see. Very cool. But as for random, I don't think so. I think God has done a good job of putting little clues all over our Earth to remind us He is out there. I am sure some scientific thinks-he-knows-it-all will slam me for my Godly beliefs, proofs on my side for this one. How large of an area is this formation? Call me a skeptic but I think the odds of this being a natural formation are roughly the same as George Bush having formed an intelligent thought. Holy Crap, it looks like an American Indian with a Maple Leaf hat! what are the chances!? any statistions out there? This image is odd due it's obvious resemblance to the image of a human. Coincidences happen all of the time. Given the unmeasurable number of events that have occurred since the beginning and the randomness of nature, it would be against the laws of chance to NOT have geographical features that resemble things we are familiar with. I am an open minded individual with many unconventional views but do not quickly jump to conclusions. The possibility that the origin of this formation is other than natural is possible, but very very far from probable. Fascinating. 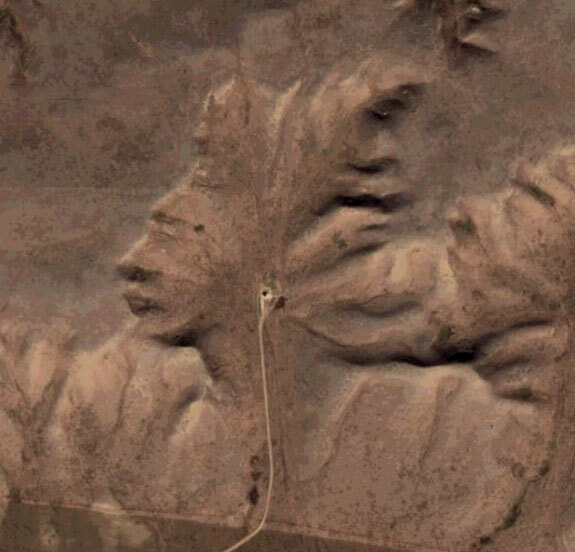 This better not be the work of some Google earth engineer siting in his cubicle and geting bored.